What is the Stock Market Game™? It is a comprehensive economics and personal finance education program for Grades 4 to 12. Small student teams compete for awards by investing $100,000 in an online, virtual portfolio. The adult advisor registers the student teams. Student teams are provided online access to their own online investment portfolio. Students research and apply their investment ideas in a real-world market environment. How Do I Register Student Teams for the 2019 Spring Stock Market Game™ in Virginia? 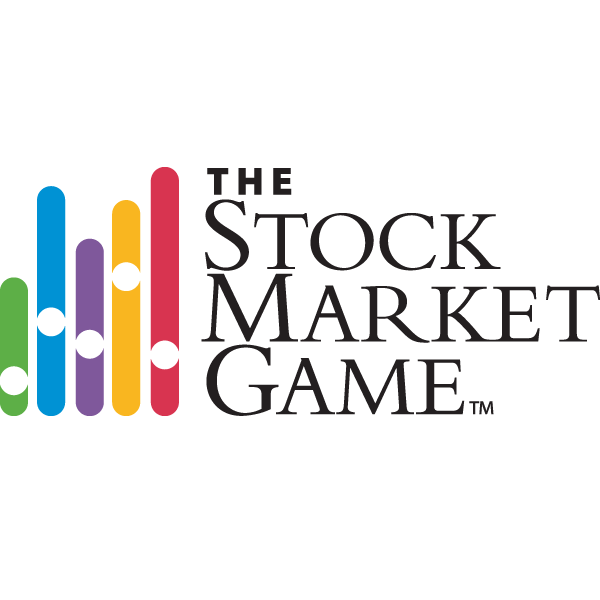 When is the Deadline to Register a Student Team for the Spring 2019 Stock Market Game™? The last day to register a team is February 15, 2019. What is the Registration Fee Per Student Team? Advisors may register a minimum of two students or up to a total of four students per team. Students may only participate on one team per Game Session (Fall, Spring and Year-Long). When are the Game Sessions? The Stock Market Game™is conducted during the school year. There are three different game sessions during the school year: Fall, Spring and Year-Long. How Can Educators Learn More about the Stock Market Game™? >> Click Here for the national website for The Stock Market Game, a program of the SIFMA Foundation. >> Click Here for additional educator resources. How Can Virginia Advisors Access Professional Development and Workshops for the Stock Market Game™? • SEVEN statewide no charge, in-person workshops for Virginia advisors. • THREE online, webinars for Virginia advisors. • THIRTY-SIX days of access for an online, virtual Open House & Educator Stock Market Game Preview. What are the Virginia Stock Market Game™ Awards? Teams are placed in regions based on the location of VCEE’s affiliated Centers for Economic Education. Regional awards are determined and presented by the Centers. When and Where is the Virginia Stock Market Game™Award Ceremony? Virginia teams are recognized at the Virginia Stock Market Game Luncheon in May at the Federal Reserve Bank of Richmond. The Virginia Council on Economic Education’s regional Centers for Economic Education also recognize regional student team winners. 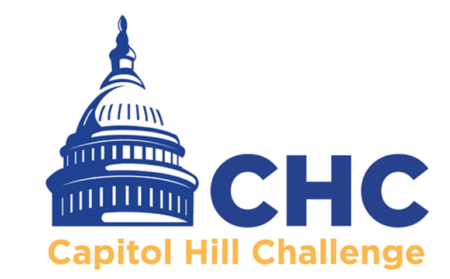 What is the Capitol Hill Challenge? The Capitol Hill Challenge is a separate educational opportunity that matches Members of Congress with students, teachers, and schools competing in The Stock Market Game™ in their respective district or state. The top 10 Capitol Hill Challenge teams win a trip to Washington, D.C. to meet their Member of Congress and be recognized at an awards reception on Capitol Hill. During their visit, students and teachers will meet with business, government, and education leaders to learn about fiscal policy-making, the role of the capital markets, and global economic trends. The winners will also have the opportunity to tour financial landmarks and national monuments.>>Click Here for details. What is InvestWrite National Writing Competition? It is an innovative national writing competition, is a program of the SIFMA Foundation offered exclusively to teachers and students participating in The Stock Market Game™. There are usually two competition sessions: 1.) the Spring InvestWrite competition where registration opens in February with essays due in mid-April and 2.) the Fall InvestWrite competition where registration opens in the Summer and essays are due in December. InvestWrite® is a culminating activity for Stock Market Game students extending students’ classroom learning with a written challenge to address real-world financial issues and situations. Students must analyze, think critically and problem solve about a long-term saving and investing scenario. Some 20,000 student essays are evaluated by teachers and thousands of financial professionals serving as volunteer judges. Winners locally and nationally rise to the top to earn exciting prizes and recognition including a trip to New York City’s famed financial district. For more details on Fall and Summer InvestWrite registration and essay deadlines and requirements: >> Click Here to view the InvestWrite website. What is Invest it Forward? Invest It Forward connects educators and classrooms with financial industry professionals and firms. Teachers can request face-to-face meetings with financial professionals for their classrooms. It is an industry-wide financial education and capital markets literacy initiative convening hundreds of financial firms that are committed to giving young Americans a solid understanding of the capital markets system and the invaluable tools to achieve their dreams. The program features a new capital markets curriculum and a variety of volunteer opportunities across the country and throughout the year. >> Click here to learn more. Are There Additional Awards or Scholarships? 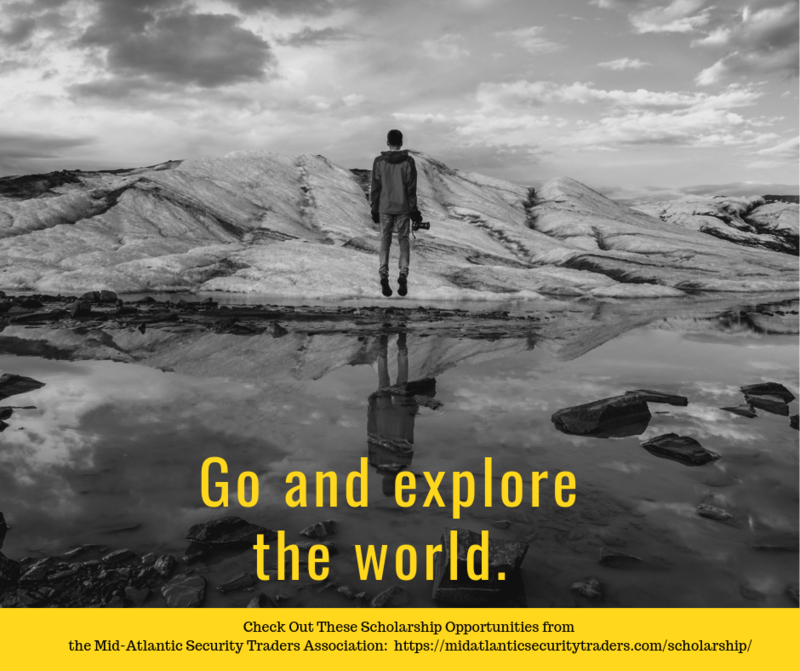 Yes, students who participate in the Stock Market Game™ are eligible to apply for college scholarships sponsored by the Mid-Atlantic Securities Traders Association. This year the Foundation intends to award two $2,000 scholarships for high school seniors who have participated in Stock Market Game (one from Maryland and one from Virginia) for their first year of college, and two $5,000 scholarships to candidates selected from our member jurisdiction of Maryland, Virginia, and Washington, D.C. 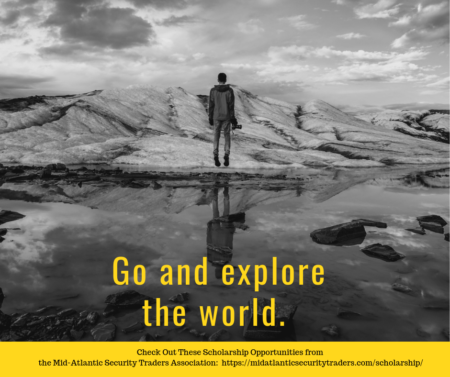 The scholarship winners will be announced in August, 2019 with monies forwarded to the respective schools on behalf of the recipients prior to the Fall 2019 semester. >> Click here for more details. 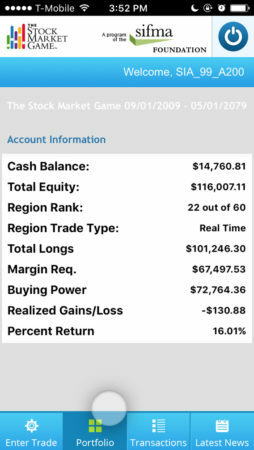 Is there a Stock Market Game App? 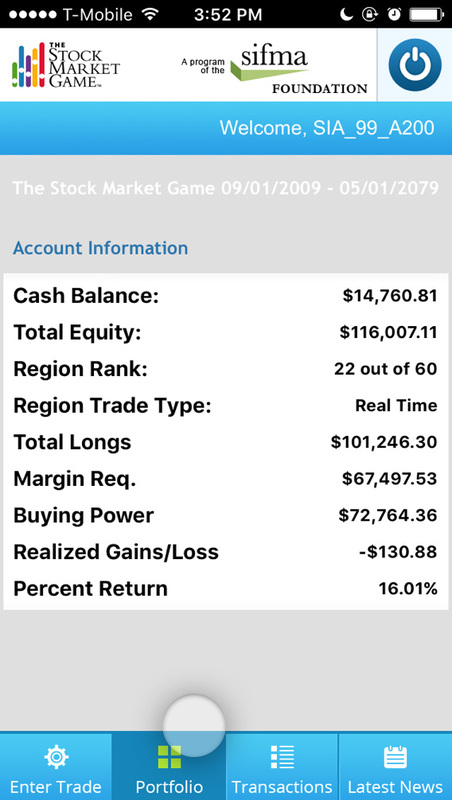 Yes, students have access to the Stock Market Game app to manage their portfolios. Who Sponsors The Stock Market Game™ in Virginia?